but that really doesn't work. It's odd, does it mean download, is there a different icon for a network save etc etc (and if you're like me and need glasses, it can look like a printer icon on a small screen). I guess we're kind of stuck with the floppy as the universal save icon until someone comes up with something with universal appeal. I find it slightly amusing that some android text editors (text edit for example) still use the floppy disk icon to mean save. The other thing would be to be to simply change the default action - when you close a document you are asked to save it. That's ok, except that I quite often want to save a copy of the file I'm working on to dropbox so I can review it at home, and then come back to the version on my machine at work the next day. So I'd need a special push to dropbox icon. which works, even though steam trains are thin on the ground these days purely because almost everyone knows what a steam train looks like even if they've only seen them on TV in period dramas. I've previously written that I'd never found printer sharing apps on printers terribly useful, and the same held for Google cloud print. Great idea, but in practice not that useful. I was working on a document and had got to the stage where I really needed to print out a draft and scrawl all over it. Except the office printer was down with a dead fuser unit. To explain, we have a big shared multi function device. I'm an 'eat our own dogfood guy', ie I believe that we should use our own services rather than bypass them by having a private correspondance printer. The confidentiality arguement doesn't applay to me so I've sent the last two printers that people tried to give me back. The only downside with the big shared device is that supplies and maintenance are outsourced, and the printer is supposed to send status messages to the maintenance company who are then supposed to pre-emptively arrive with new bits before it goes offline. Most of the time this works pretty well, but sometimes just in time turns out to be just too late. We do keep an old laserjet on the network as a standby, but rather than that ,I thought I'd just drop a copy in dropbox and print it at home. Then I had a lateral thought - use Google's cloud print. So I downloaded the webabode cloud printer app of OS X, clicked on the printer I wanted to print to and clicked on the file to queue it, locked my computer and went home. At home I powered up the printer and opened up my Dell laptop. I did have to restart chrome to get the printing to work, but sure enough, once I'd restarted chrome the printer whirred and out came my document. Over the years I've said various things about student filestores, but now is probably the time to finally lay the corpse out in its box. As soon as we get to a situation where students routinely have multiple computing devices they need to share information between them. Historically they did this by walking about with floppy disks in the bottom of their work bags and more recently with usb sticks. However as soon as you start finding people using information access devices that lack usb ports the game changes. They start sharing files over the network between their various devices. And of course sharing information between devices is really just a restricted version of sharing information with other users. Google drive. Functionality much as dropbox but with the added advantage of a web based editor and co-operative editing facilities. Can export documents in standard (ie Microsoft, Libre Office and as PDF). Skydrive. Uses Microsoft style formats by default. Generous amount of storage (7GB), and accessible via a standard browser or via Apple or Android clients. Plays nicely with local Office installs. There are other services, for example Box.net that provides much the same functionality as dropbox. Even the latest version of AbiWord comes with a built in document collaboration and sharing service. So we can say that student filestores are dead. No one needs to use them and some of the alternatives are possibly better. Even the old canard about getting files back from a backup doesn't really apply – use google docs or skydrive and your deleted files live on in a recycle bin and even dropbox caches deleted files. In fact things are considerably better than if you walk around with your data on a USB stick – and potentially safer. So we could quite sensibly say that we could run without student filestore provision – all we need do is nominate a preferred service. This isn't as radical a move as it might have been a few years ago – people are accepting of using cloud storage for their music, so having them self outsource their data to the cloud is not such a stretch. All that is lost is the joy of managing student filestore …. Strictly speaking this is a service announcement - for quite a few years now I've used Tungle.me to let people schedule meetings with me. It's been especially useful when scheduling skype calls with colleagues overseas as it's avoided the 'if it's 5 PM in Canberra it's just a little too early in Manchester' to and fro. As of 3 December Tungle.me will close. Unfortunate, but then as I never paid for the service, always using the free version, I've no reason to feel more than mildly irritated. It also points to one of the inherent problems with using many of the free services out there - sometimes they fail and sometimes they just go away. For example, in the past year I've lost both of my third party unix shell accounts, ie my command line login on time sharing machines not on any of the networks I normally connect to. Not essential, but mildly useful to check things out, or make sure that a firewall somewhere was doing what it should. I've been using my little seven inch tablet for a fortnight or so, and I must say it doesn't disappoint. The ability to type notes as we go and then save them to dropbox or evernote is incredibly useful, as is having a browser to check things, or be able to search one's evernote documents (to give some perspective I have around 3000 separate notes. On the downside, battery life and power management has been interesting to say the least. Let's just say that using wifi chews battery and leaving it in standby mode is not the answer – it has a tendency to suddenly wake up. On the other hand, if it's reasonably charged it will cope with three or four hour's use reasonably well. Having a car charger has been useful – I plug it in on the way in and on the way home to give it a jolt which helps me get through the day. I've also pruned the application choice somewhat. I'd added a printershare app and then found it less than useful. LaTeX has gone to be replaced with TeD. I've added the connectBot ssh client, but I've also got rid, for the moment, of the newspaper apps. It also managed (or maybe I did accidentally) to screw up it's internal storage to the extent of needing an OS reset, which at least gave me the opportunity to comprehensively de-crud it. Today I used the seven inch tablet in anger to take notes during a four hour workshop session this morning. 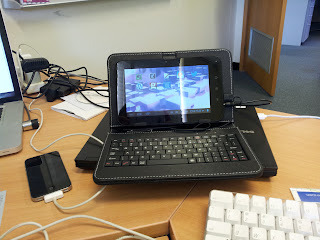 Whie it could be argued that in the way I've set up the tablet I've basically created a netbook style environment, or more accurately an environment like that of the original Eee netbooks there are a couple of key differences. Data is saved to the cloud where possible. This morning I saved it straight to Dropbox from epistle. Once the workshop was over I headed back to my office and used Libre Office to fix up the myriad typos and pretty up the layout for legibility and then saved them as a pdf direct into evernote. The other key point is it was a four hour session. I took around four pages of notes. My battery was more on less 100% when I started and just under forty when I finished – better than a netbook, better than my MacBook pro. Size. Like a netbook it's light, and hence easy to carry, And having Evernote on it it's easy to show people related material in an informal chat afterwards and if necessary email it to them. as well as the usual twitter, gmail and calendar applications. Nothing much else other than a weather app and some newpaper apps in case I end up stuck somewhere. The idea is to only add applications that deliver value – so I imagine there will be a number of document viewers for Libre/Open Office and Microsoft Office files stored on skydrive and dropbox. The secondary idea is to make this device as state free as possible with all documents pushed to cloud services as much as possible – that way documents should always be accessible from any device – an 'any time, anywhere' martini style service. One thing I havn't considered is printing. While there are a number of printershare applications out there I've never actually ended up using them, despite having installed them on my existing tablet – basically if you want to print it, you probably want to save it somewhere meaning you can print from some other host. Over the past few months I've written about both using seven inch tablets as note takers and the use of Dropbox as an active filestore. I ordered the device through ebay – delivery took longer than expected, not due to any problems at the seller's end but more due to the postal authorities at Shenzen rejecting the package first time around, and taking two weeks to do so. The second time the vendor sent it EMS and it arrived in under ten days. As a consequence, I've only just received and configured it – I still need to use it seriously to see how useful it is in practice. However, its not just me that's discovered the power of no name Android tablets from China. Last weekend we went down to the coast and stopped off in Bateman's Bay to pick up some bits and pieces. We were a bit later than planned and most of the stores were winding down but Aldi was still open.